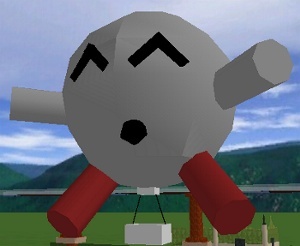 This pack includes a Nimbusian-shaped Hot Air Balloon (created by Espilae) that can be used to travel around in style. This mover uses v4 objects (mover), so make sure you have v4 rights in the world your are building this in. This mover is saved as an Object Group, so place the base object where you want the center of the balloon basket to be. There is only one file in this pack; a balloon that faces north. Manual rotation of the balloon is not difficult. 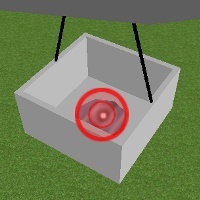 If your balloon doesn't work for you, select the Mover control object and make sure it has Linking Enabled. Click the area shown below (while standing on it!) to board the balloon. Multiple passengers must do the same.